What are the Best Rated Chainsaws? Have you been wondering which chainsaw is the best for your needs? Hopefully, this article will clear that up for you. There’s a big debate about whether to go for a gas chainsaw, a corded electric or battery chainsaw and opinions differ. Truthfully, you can get a great chainsaw in any of these categories – it really depends what you need it for. So before we go on to review the best rated chainsaws available to you, let’s look at what type of chainsaw is your best option. If you ask any professional lumberjack, they’ll probably tell you that gas chainsaws are the only real option. This can be true if you need a very powerful chainsaw that can be used anywhere and allows you to work for hours without interruptions. The question is, how many of us actually need all that power and are you going to be using it far from an electrical outlet? Let’s start by saying that if you’re going to be cutting large trees fast and efficiently, even if you’re miles away from anywhere, then a gas chainsaw will be your best bet. The downside to using a gas chainsaw is the noise, this can be a big disadvantage for homeowners, living in the suburbs. Your neighbors will very likely voice their objections to you disrupting their peace and quiet with a roaring beast of a chainsaw. Gas chainsaws can also be quite heavy, making them difficult for some people to use. High levels of vibration from the engine can also be problematic for some. The maintenance required to keep a gas chainsaw functioning properly is much more than their electric equivalents. You need to keep the engine serviced and, of course, they can sometimes be a hassle to start – especially in cold weather. For some people, the emissions from the gas engine can also be a problem. Because most gas chainsaws use a two-stroke engine, there’s also the need to mix gas and oil to the correct ratio. If you don’t, you’ll either get a smoking machine and the carb will become clogged with carbon (if you mix too much oil with the gas) or, if there’s too little oil in your mixture, the engine will overheat and sustain damage. So, while gas chainsaws may be the number one choice for most professionals, your average home user may prefer a chainsaw that’s easier to use and requires less maintenance. Even if this means opting for a less powerful machine. Going electric takes a lot of hassle out of owning and using a chain saw and they’re generally much cheaper than any other option. An electric chainsaw that runs on household power via an electric cord is great for use around the yard – cutting firewood, maintaining your garden and also for woodwork artists. Cord electric chainsaws are relatively light and, therefore, easier to use. Because they’re not as powerful as gas chainsaws, electric models will not have the largest bar and chain (usually no more than 18”). This is fine for most of us but if you’re looking for a heavy-duty chainsaw with a bar length of 20” or more, you will have to get a gas machine. Even the most powerful 15A electric chainsaw won’t be able to hold up to the bigger gas chainsaws. Obvious advantages of electric chainsaws are the fact that they produce a lot less noise and there are no toxic emissions. Many also prefer electric for the ease of operation. There’s no pulling on a recoil starter – you simply press the start button and off you go. Because of the many advantages of using an electric chainsaw, they’re very popular for home users who really don’t require the extra bar length and power of a gas chainsaw. The biggest problem with using a corded electric chainsaw is that you always need to be close to a 120V power source. In your garden, this can often be okay, if your yard isn’t so big that you can’t reach everywhere with an extension cord. 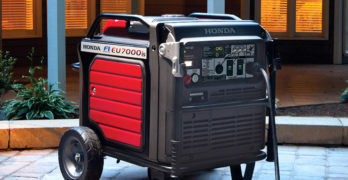 If you’re working too far from an electrical outlet, you’ll need to use a generator and this will require gas and can have the same noise issues that you get with gas chainsaws. Though you do get silent generators that are barely audible. For quite a few years now, battery chainsaws have grown in popularity. This is mainly due to the improvement of battery technology. Major tool manufacturers have invested massively in battery research and development. Because these tools are so versatile, combining the ease of use that you get from electric and the freedom of movement that you get from gas, many people are choosing battery power over other types of power tools. Even though modern lithium-ion batteries offer improved working times, you are still limited to battery life. This can be a problem if you intend working for long periods. Though most of who have come to depend on battery tools have realized the value in buying extra batteries. With enough batteries, you’re able to work for any length of time. So the only real drawback to buying a battery chainsaw is the cost. A battery chainsaw costs more than a corded electric equivalent. If you’re going to buy extra batteries, your cost goes up even further. They’re also slightly heavier than traditional chainsaws that use a power cord. Despite these disadvantages, battery-powered chainsaws are growing in popularity. In my experience, battery tools make life much simpler. 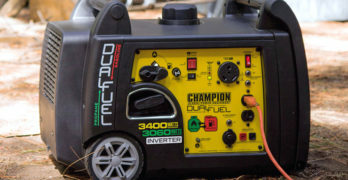 If you’re one of those people who use a number of battery tools, it makes sense to use battery power wherever possible, provided you use tools that all use the same battery. Having a wide range of tools that use the same battery, reduces your costs considerably (you don’t need different batteries for each tool). The more tools you use (with the same battery), the more cost effective it becomes to buy extra batteries. There are a lot of people who shy away of from chainsaws because they seem so dangerous. It’s true that you need some skill to use a chainsaw safely and there are a number of risks involved. If you’ve stayed away from chainsaws for fear of losing a limb, there’s a fantastic alternative to regular chainsaws. The “Jaw Saw” is designed for easy and safe operation, though you are limited by the cutting width that the jaw offers. We’ll review this revolutionary new idea as an alternative for people who want to clear up branches but have never felt safe using a regular chainsaw. More on the WORX Jaw Saw WG320 later in the article. So whether it’s the power of a gas chainsaw you’re looking for or the affordability and convenience of an electric model or, perhaps, a bit of both by choosing a battery chainsaw, you’ll want to get a good bang for your buck. Chainsaws are some of the more expensive power tools to own, so you want to get something that’s going handle the work that you throw at it and still fall within your price range. This review is going to cover the chainsaw models that are rated most highly by those who’ve bought them and are happy with what they paid for. To make it onto our list of best-rated chainsaws, these products had to receive the highest ratings from hundreds of satisfied customers. This will help you in your decision, all these people can’t be wrong. It’s no small feat getting great ratings by genuine customers. If you think that people are quick to complain when they have a problem with a product but seldom bother to write in and say that they are impressed, ratings will usually be slanted toward the unfavorable outcome. We’ve researched thousands of customer reviews to give you the best options in the view of ordinary users like you. So you can cut through all the sales talk and get straight to the point. Which chainsaw is going to give you the best value for your hard-earned cash? To cover all the bases, you will have a choice between the best electric, battery, and gas chainsaws. As a bonus feature, we’re also going to include the Worx WG320, a jaw saw that makes for the safest and most convenient way to cut branches and logs. Let’s start by looking at the best electric chainsaws by way of consumer ratings. In terms of affordable quality, there really can’t be a better option than these models. Worx tools always seem to feature highly and receive many positive reviews. I think this is because of the combination of price vs quality. They don’t cost as much as many premium brands but still offer a high standard of build and design, making them incredibly good value for money. The Worx WG303.1 is a 14.5A electric cord chainsaw with a 16” bar and chain. There’s a larger version of the same chainsaw, the Worx WG304.1, which is a 15A model with an 18” bar and chain. The only difference between the two is that they have different motors and different ratings for bar length. In all other respects, their features remain the same. Whether you choose the Worx WG303.1 or the larger Worx WG304.1, you’ll get all of the safety features and convenience that you’d want from an electric chainsaw. They have an automatic chain tensioner, requiring no tools. The benefit of this mechanism is that it’s impossible to over or under tighten the chain. This makes them one of the safest chainsaws, particularly for people who are not too familiar with how to tension the chain correctly. It also has an automatic chain brake for increased safety. Like most modern chainsaws, the Worx WG303.1 and WG304.1 have automatic chain lubrication and these two have a 200ml oil reservoir which includes a level indicator. Many users have noted that the lubrication system uses a lot of oil and the reservoir needs to be filled more often than most. One guy suggested using thicker oil to reduce the amount of oil used. While another user said that using thicker oil causes the automatic lubrication system to stop functioning. I’d say that over lubrication is better than under lubrication. That extra oil that’s being pumped onto your chain will help the saw remain sharper for longer and increase the lifespan of the machine. So, I’d recommend using the specified SAE30 oil. Using a bit more oil may increase your running cost slightly but it will save you money in the end as the chainsaw will keep on working perfectly for a longer period of time. Using these chainsaws is a real pleasure. They’re lightweight – the Worx WG303.1 weighs 11 LBS and the Worx WG304.1 weighs 11.2 LBS (machine weight). They have comfortable handles that give you a good grip on the machine and allow you to work for long periods without experiencing fatigue. Worx equipment is widely accepted by many homeowners as providing exceptional value for money. The automated operation of the Worx WG303.1 and WG304.1 make them about the easiest and safest chainsaws to use. Their design is perfect for home users, who are not as experienced as the professional. With a 3-year warranty and 30-day money back guarantee, you can have a great deal of confidence in your purchase. 13 Amp Corded-electric chainsaw. One of the best rated chainsaws on the market. Powerful and well-made electric chainsaw. The name Zombie really appeals to my sense of humor, conjuring up images from apocalyptic films of chainsaw wielding zombies. Not that these films are a joke, it’s the fact that a serious piece of hard-working machinery can be named in this way that made me chuckle. Make no mistake, the Zombie ZCS12017 is manufactured by a serious company. The American Lawn Mower Co, the name behind the Zombie brand, has been around since 1865. So despite the tongue-in-cheek approach to naming this chainsaw range, they are, in fact, serious competitors in the chainsaw market. When you look at the Zombie ZCS12017, that sense of ironic humor continues into the funky Zombie color scheme of the machine. Though the design and functioning of this chainsaw is no joke, it competes well with the best of them. The 13A electric motor drives an Oregon double guard 16” bar and chain. Most professionals swear by Oregon as the number bar and chain manufacturer. The chain is self-lubricating and requires no tools for tensioning. The two large steel bucking teeth are designed for heavy-duty work and are extremely durable. Weighing around 13LBS with fantastically designed handles, the Zombie ZCS12017 is a great chainsaw to use. The soft grip front handle has a wrap-around design, giving you the ability to work safely and comfortably in any situation. The chain guard is also well-positioned for both safety and maximum visibility whilst working. The electric cord is double insulated for added safety. In my search for complaints about the Zombie ZCS12017, I came up with no real complaints (at least in my opinion). I saw that one guy complained about the chain coming loose, but I find that hard to believe as Oregon is generally considered to be the best. The fact that I haven’t anyone else with the same complaint, leads me to believe that he didn’t tension the chain correctly. Unfortunately, there’s no cure for stupidity. Other than this one complaint, the majority of people seem to feel that the Zombi ZCS12017 is a fantastic electric chainsaw. The American Lawn Mower Company offers a 5-year warranty on their tools, though I couldn’t find any details on the actual warranty agreement. Read our in-depth article on Zombi chainsaws. For many people, paying extra for the versatility of a battery-powered tool is money well spent. If you’re one of these people, here are some fantastic options when looking for a quality battery chainsaw. ✓ View or download the MANUAL for the Black & Decker LCS1020. The Black & Decker brand is synonymous with affordable quality and they’ve been around since 1910. This trait has made their products a household favorite around the world for over a century. When it comes to battery chainsaws, we have selected two models that exemplify this philosophy. The Black & Decker LCS1020 is the first model that we’ll be looking at. This a small (10”) chainsaw that’s suited for smaller cutting jobs around the yard. Felling a large tree with this model will be a time-consuming job and you’ll probably find it easier to use the larger Black & Decker LCS1240 if you’re going to be doing larger jobs. That being said, the Black & Decker LCS1020 is fantastic for cutting firewood and clearing up branches. It’s incredibly compact and light, weighing only 7.2 LBS, you certainly don’t need to be a burly lumberjack to handle this little machine. Great for small cutting tasks around your home. It’s powered by the Black & Decker 20V MAX lithium-ion battery that provides a good working time, considering that it’s not a very big chainsaw. You’re looking at around 20 minutes of working time using the standard 2AH battery – ±150 cuts on branches with a diameter of 1½”. There’s also an optional 4AH battery if you want to double the amount of time that you’ll get from the battery. This battery can be used with any Black & Decker tool in the 20V MAX range. It’s a really easy machine to use with tool-free chain tensioning and convenient wrap-around front handle. The Amazon website claims that the Black & Decker LCS1020 is auto-lubricating, though this is somewhat misleading. It has an oil primer button that has to be pumped in order to get the oil flowing, so it’s not entirely automatic. The chainsaw makes use of an Oregon low kickback bar and chain, making it really safe for novice users and the large chain guard that also functions as a chain brake is well positioned and adds to your safety. Black & Decker offer a full 2-year repair or replace warranty on this product for home use. You also have the peace of mind that you are buying an established brand with a great backup service and parts are readily available. For a durable chainsaw for under a hundred bucks, you’re really getting a great deal on the Black & Decker LCS1020. Visit the Black + Decker site to learn more about the LCS1020. 12″ Oregon low-kickback bar and chain. ✓ View or download the MANUAL for the Black & Decker LCS1240. If you feel that the Black & Decker LCS1020 is a bit limited for your needs, the Black & Decker LCS1240 might be more to your liking. This model has a 12” Low-kickback Oregon bar chain. So it’s just as safe to use but offers you an extra 2” of bar length – a distinct advantage when cutting down large trees. It’s more powerful, using the Black & Decker 40V MAX battery. You get a standard 2AH battery with the machine or you can buy it without a battery. The Black & Decker 40V MAX range of tools include a number of high-powered gardening tools including a lawn mower, so you can use the same battery for all gardening needs. Easy to keep the chain at the right tension with the adjustable knob. It has a tool-free chain tensioning knob and a fully automatic chain lubrication system. It’s almost as light as the smaller 10” model (the Black & Decker LCS1240 weighs 8.3 LBS) and is just as easy to use. The Black & Decker LCS1240 has the same wrap-around soft grip front handle and large chain guard. The Black & Decker LCS1240 is quite a bit more expensive than its smaller brother but it’s, altogether a different machine with a larger motor, battery, and bar. This model also comes with a longer warranty period of 3-years. Highly rated with very satisfied customers. Powerful battery chainsaw. When you compare the price of the DeWalt DCCS670X1 with the previous two Black & Decker chainsaws you may take a step back and wonder why this one is so much more expensive. I’ll start by saying that it’s a DeWalt product which, in my opinion, is worth paying more for. But beyond the fact that this is a premier brand, the DeWalt DCCS670X1 is in a completely different class. This is a 16” chainsaw, so it’s up there with the big boys and uses the Oregon low-kickback bar and chain with automatic lubrication. There aren’t many battery chainsaws that can compete with gas machines but this is certainly one of them. The 60V MAX battery, combined with a super-efficient brushless motor gives the DeWalt DCCS670X1 superior capabilities and extended battery time. While this model comes with the standard 3AH 60V MAX battery, it’s compatible with the DeWalt 20A/60A FlexVolt system – giving you the choice of either 6AH or 9AH and a flexible voltage range. This means that you can use the same FlexVolt battery for any DeWalt power tool in the 20V MAX or 60V MAX range – well over 100 tools that use the same battery. I’ve always maintained that Makita is the world leaders in battery tools as they have been doing it for the longest. However, since the launch of the DeWalt FlexVolt battery, I’m having a hard time deciding which is best. These batteries not only give you just about the best working time but the versatility that comes with the dual-voltage battery is unrivaled. 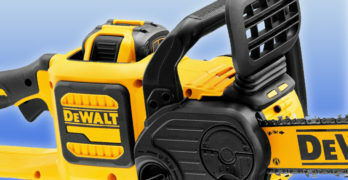 Apart from having the option of one of the best batteries available, the DeWalt DCCS670X1 has many other advantages. Their tool-free chain tensioning is one of the best and will ensure easy and perfect chain tensioning for many years. It also has automatic chain lubrication, which is pretty standard these days and, as one of the best, DeWalt would have to include this feature. The Chain guard/chain brake is also one of the best designs, it’s large enough and easily accessible in an emergency yet doesn’t obstruct your line of sight in any way. Really comfortable soft grip handles, with the front handle being a full wrap-around design makes for really easy handling. With a machine weight of only 12.2 LBS, the DeWalt DCCS670X1 gives you the advantage of a 16” chainsaw that is as easy to handle as much smaller ones. When it comes to design integrity and robust build, there are very few brands that match up to DeWalt’s impeccable standards so you can be assured of many years of hassle-free use. One of the reasons why I’m such a big fan of the DeWalt brand is their commitment to backup service and a warranty that’s hard to beat. The DeWalt 3-1-90 limited warranty agreement is really one of the best that you’ll find. Though they use the word limited, there aren’t any real limitations unless you go out of your way to abuse the machine. You get a 3-year warranty, a 1-year free service plan and a 90-day money back guarantee. DeWalt is a company that’s serious about upholding their good name. This shows where it counts, in honoring their warranty and providing excellent service to their customers. If you want a tool that’s going to be with you for many years, it’s definitely worth paying a few dollars more for this assurance. The DeWalt DCCS670X1 is one of the best rated chainsaws on the market that deserves your consideration. Another DeWalt consideration : 40V 16″ — DEWALT DCCS690H1 : Comes with 6AH Lithium-Ion battery. Although gas chainsaws are mostly used by professionals (Lumberjacks and rescue crews), there are homeowners and farmers who choose gas over electric. If you need a powerful chainsaw that can be used where electrical supply is a problem and a battery chainsaw isn’t powerful enough or doesn’t give you the working time that you need, a gas chainsaw is going to be your best option. In that case, the Husqvarna 455 Rancher should be an obvious choice. Best rated gas chainsaw : 20″ 55.5cc. Consider this a classic heavy-duty homeowner chainsaw! Best all-around gas chainsaw for homeowners. LowVib System designed to reduce vibration levels to the operator. ✓ View or download the MANUAL for the Husqvana 455 Rancher. I’m sure many of you will agree that Husqvarna is the go to brand for gas powered tools. Their experience and reputation for quality and exceptional service have made them one of the most sought after names when it comes to outdoor power tools. When it comes to chainsaws, the Husqvarna 455 Rancher is certainly one of the best that you’ll find. Let’s take a look at why this machine is rated so highly. For a gas chainsaw with an excellent power to weight ratio, the Husqvarna 455 Rancher is a real winner. The machine weighs only 12.8 LBS (without bar and chain). For a chainsaw that has a recommended bar length of 20”, this is exceptional. The Husqvarna 455 Rancher has all the power that you’ll need to make light work of large jobs. The 55.5cc 3.49 HP engine gives 9000 RPM at maximum power (idling RPM is 2700). This results in a maximum chain speed of 65.6 feet per second and 3.2 NM torque. Apart from delivering fantastic power, this engine has a load of great features and displays the characteristics that come from many years of product development and industry experience. Many of the problems that are unique to the working environments and user requirements of chainsaw owners have been resolved in the design of the Husqvarna 455 Rancher. Most users of gas chainsaws will be familiar with the irritation of woodchips and sawdust clogging the air filter. Well, the guys at Husqvarna have found a way of reducing this. A centrifugal system used on air intake removes most of the particles from the air before they reach the air filter. This means that you can work for much longer before cleaning out the filter and it improves engine life. Another reason why gas chainsaws are less popular than electric is the high levels of vibration. By improving both the engine and handle design, Husqvarna has managed to produce a chainsaw with very low vibration levels – 3.4m/s² at the front handle and 4.5m/s² at the rear. This means fewer aches and pains in your fore arms when working for extended periods. With noise levels being a common complaint associated with chainsaws, the engineers at Husqvarna have put a lot of research into eliminating this too. The result is that the Husqvarna 455 Rancher has a noise level of 104 dB(A) at the operator. From a few yards away, this noise will hardly be noticed – great news for people who need to use a chainsaw in urban areas. As an established international brand, Husqvarna understands the need to meet the most stringent environmental standards. In some countries, environmental regulations are incredibly strict. The X-Torq engine that has been developed for the Husqvarna 455 Rancher, not only meets all international environmental regulations but is also one of the most fuel efficient. It, therefore, goes without saying that the Husqvarna 455 Rancher is CARB compliant. The Husqvarna 455 Rancher also uses Smart-Start technology that eliminates all the problems of starting a gas chainsaw. You won’t be tugging repeatedly on the recoil starter in cold weather. It also has flow control on the automatic chain lubrication system. This means that you can adjust the amount of oil flowing to the chain to meet your working conditions. As far safety goes, this has also been taken care of in the best way possible. A sturdy and well-designed chain guard and inertia activated chain brake give you the most advanced safety features of any chainsaw. Despite all the cutting edge technology that’s gone into the design of the Husqvarna 455 Rancher, you still need to tension the chain the old-fashioned way – so you’ll need tools to do this. Admittedly, this is a more robust system and will remain reliable for many years down the line. The side mounted chain tensioning system does make the job easier. 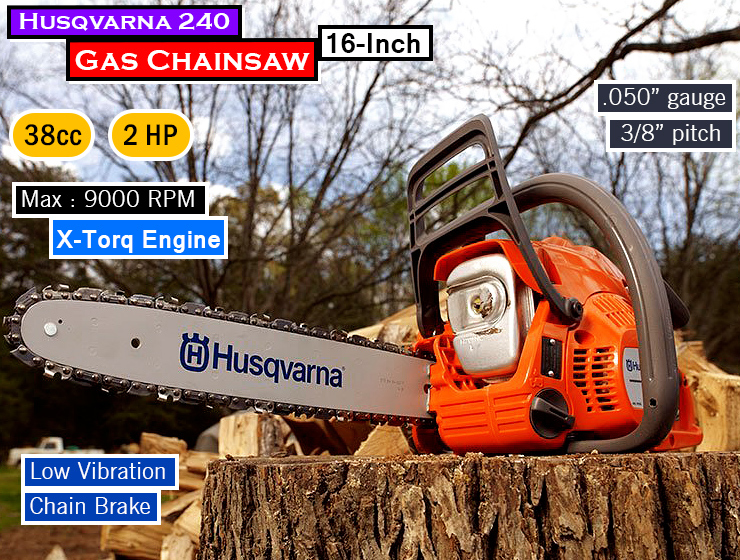 As you can see, the Husqvarna 455 Rancher is one of the most advanced gas chainsaws on the market. You can also make your purchase with the knowledge that you are buying a product from a company that is known for excellent service backup and you’ll never have a problem getting spares and accessories for the Husqvarna 455 Rancher. Read our comprehensive review of the Husqvarna 455 Rancher or visit the Husqvarna site to learn more about their extensive line of chainsaws. Not everyone is up to the challenge of handling a chainsaw. For some, the thought of using a machine that can rip through a tree stump is just too frightening and there are others who just want to cut firewood or remove unwanted branches with the least amount of effort. If you want a safer, trouble-free alternative that will do most of the same work as a regular chainsaw, then a jaw saw is just what you’re looking for. If you’ve never seen one of these machines before, here’s a brief description of how a jaw saw works. The chain saw bar is enclosed, meaning that there’s no chance of the user ever making contact with the cutting teeth. It’s perfectly safe and you don’t need much skill to operate a jaw saw. It has powerful steel “jaws” that grips the branch and holds in position while you cut, even if the branch is lying flat on the ground. Once the piece that you’re cutting is firmly in place, the saw will cut through the branch just like a regular chainsaw. Because it has a reasonably long handle (usually with an extension for cutting branches that are high off the ground), you are always far enough from the blade and there’s very little chance of splinters and wood chips harming you. A jaw saw is a very safe and convenient way to accomplish cutting tasks where a chainsaw is required to do the job effectively. The only limitation to a jaw saw is the width of the jaws. This means that you can only cut branches that are able to fit into the jaws on the saw. The jaws are usually designed to hold branches around 4” in thickness. This is perfect for cutting most branches and firewood. 20V Battery powered chainsaw alternative. Ultra-safe to use! Perfect for pruning and trimming around the yard. The Worx WG320 is designed to make your life as easy as possible. For maximum convenience, this jaw saw is cordless, making use of a 20V Lithium-ion battery that gives you around 20-min working time on a charge. The battery takes approximately 3-hours to charge and you can get back to work. Of course, there’s always the option of getting extra batteries and there are quite a lot of Worx tools that use the same battery. It’s very light (7.9 LBS) and the excellently designed handles make for effortless and safe operation. With a 6” bar and chain and jaw capacity of 4”, you’ll be able to cut through most branches. The jaw is designed so that it can cut pieces that are lying on the ground. This means that there’s no heavy lifting. The handle length and easy operation enable you to work standing up and easily cut fallen branches, holding the WORX WG320 jaw saw in one hand. If you need to cut branches hanging over your gutters, there’s an optional 5Ft extension giving you the reach that you need without climbing up a ladder. Automatic chain lubrication and an automatic chain tensioner mean that there’s no skill needed to get going with this machine. It’s always safe and there’s very little that you need to do. This must be the most convenient cutting tool for keeping your garden in tip top shape and keeping your home supplied with firewood cut to the exact length that you require. Worx garden tools are known to be both affordable and reliable, making them extremely popular with homeowners. To this end, you get a 3-year limited warranty and a 90-day money back guarantee on the WORX WG320.